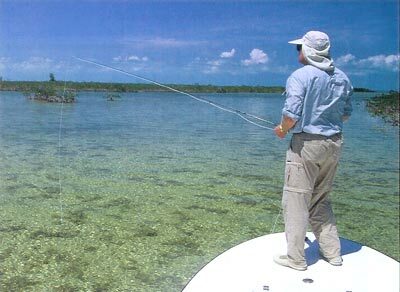 ONE OF THE MOST IMPORTANT aspects of fly fishing for bonefish is the proper approach, which should leave you set up to cast accurately and within your range, with the best wind conditions and visibility possible. The targeted fish should not sense your presence to any significant degree until he feels the hook. And when you call pull this ruse on, say, a big Florida Keys bone, which are some of the most educated fish on the planet, you will have earned your PhD in the art and science of bonefishing. Far too many anglers, however, mess up before they even see a fish. For instance, if you are fishing a flat by boat, the first cardinal rule is this: Don’t run the skiff all the way to the flat. Even an idling engine will spook bonefish for many hundreds of yards. Instead, if the surrounding water is shallow enough, stop 100 yards or more from the edge of the flat and quietly pole in. During that time, anglers can be getting the tackle ready or training their eyes to the water. So by the time you hit the edge of the flat, your angler is prepared. And often the best fish of the day will be on that first flat early in the morning. Because sound travels better through water than air, any noise that comes from inside or outside the skiff is deadly. The constant slap of waves against a hull, or dropping a pair of pliers on the bottom of the boat, or closing one of the hatches a bit too loudly can all send a bonefish to the next flat. Rocking back and forth during your false casting also rocks the skiff, creating a series of bow wakes with every false cast. Bonefish can detect these wakes very easily, even the faintest ones, and may stop feeding or leave. Approaching a fish early or late in the day can often throw a long shadow, which tends to spook bones. So try not to cast your shadow in the fish’s direction. In order to be consistently successful, everything that could go wrong should be made right before you even cast. Not every bonefish that senses the skiff or an angler leaves the flats in a rush. Sometimes, the bonefish suspects there is something wrong, but he keeps on feeding more or less normally, possibly even moving toward you. I find that there are degrees of spookiness; that is, not every bonefish that senses the skiff or an angler leaves the flats in a rush. Sometimes, the bonefish suspects there is something wrong, but he keeps on feeding more or less normally, possibly even moving toward you. Here it is best to cast a bit away from the area of awareness so that your fly drops in less intrusively. But if the bone is so aware that he is now constantly moving away from you as you pole and cast, you are better to let him go, calm down, and start looking again. If you have disturbed a large school, you could try one last cast to the side and hope a couple of fish break away to chase the fly. But good luck. And remember that you are not the only predator on the flat. The proximity of sharks or barracudas or birds can quickly change a bonefish’s appetite, so you must always try to read the fish’s body language as he swims or feeds. With time, you’ll be able to tell if he is happy and feeding or if he is stressed. And while you may not be able to relieve his stress, you’ll know to be more careful and cast a little bit farther so as not to spook him. A bonefish tailing in shallow water can be incredibly nervous. He is very sensitive to sound, movement, or shadows, any of which could be a predator. And in order to find his food, he generally has to push his face against the bottom, so he can’t always be watching out for danger. And if the bottom has long turtle grass, his area of awareness is further limited. Now add to this the fact that you must cast very close to the fish without spooking him. At the same time you have to approach closely enough to ensure such accuracy and also close enough that, if you miss your cast, you can pick up and try again. Finding that fine line between being too far to cast and too close to fool the fish can be nerve-racking. 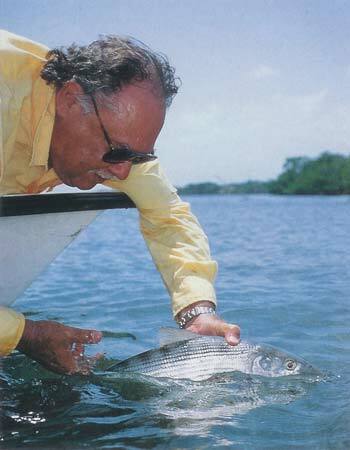 The author taking time to gently release a nice bonefish. If you can determine the approximate direction he is feeding, which is often into the tide, you can cast a bit ahead, leave the fly still, and let him move toward it. When you judge that he has the fly within his area of awareness, twitch it just enough to get his attention. Also, while most flats require that you use your wading boots to protect yourself from the many sharp and hard structures and animals in that environment, there are some flats, such as in the Bahamas and some areas of the Yucatan, that are firm and sandy enough to wade barefoot. This is the quietest method of wading, but be sure to ask your guide to make sure it is safe to do so in that area. Because cruising fish are generally in much deeper water than tailers, and because they are looking out and not down, they have a much larger area of awareness. Here the window of opportunity can be from about two feet to more than six feet, depending on depth. If a cruiser is going to the left or right, cast in front of and maybe a few inches past him, but no more than that. If you cast well past his line of vision, even if the cast does not spook him, and then you start to work the fly, you will be moving it toward him. This is almost sure to spook a bonefish. I know it does not make sense for a 10-pound fish to spook from a 1-inch bait imitation, but prey moving toward a bonefish is simply unnatural to him. I have seen plenty of 6-foot tarpon spook from a 3-inch streamer moving toward them. gets even closer, he could spook. Perhaps a better strategy is to cast slightly to the right or left of an oncoming fish, so that when he does chase the fly he is forced to move to one side, therefore taking the boat or angler out of his view. When a bone is feeding on a soft-bottom area such as on an inside or bay-side flat, a visible, often compact mud occurs. A large school can create a very prominent and visible mudding area. When fishing for mudding bones, it is essential that you determine in which direction they are feeding, because by the time you cast to the last mud, the fish can be many feet ahead. Ideally, it is best if you can see the fish, which usually show quite dark in this environment. Then you can cast to an individual bone. But if you cannot see them, try casting a bit ahead of the last mud — even if you don’t see anything. You may be surprised by a hard strike. Bonefish schools, sometimes very large schools, will also mud in six to ten feet of water in many parts of the world. It is not like fishing the flats, let alone sight casting, but it can be fun for a couple of hours. I have seen deep-water mudding areas larger than an acre. You just cast on the most active part of this giant mud, which looks like a mud within a mud, and let the fly get close to the bottom. On several occasions, when I was in the mood and found such schools in deep water, I have been able to land dozens of bones in just couple of hours. It’s fun, but no challenge, although sometimes that’s okay, as well. Too Close, Or Not Too Close? Within reason, different distances will work in the same fishing situation. That is, a good caster may start his cast sooner and throw 65 feet to a bonefish, whereas a novice may start later and end up casting only 45 feet — and still both might catch the fish. However chances are that, day in and day out, the better caster will spook fewer fish and land more of them. So practice, practice, practice. And when you can get some distance, say more than 60 feet, start practicing with a fly with the hook cut off. And then practice with the fly on water. Allow yourself to make mistakes; be patient and enjoy it. A good approach requires premeditation of all the above variables and more. You must make sure that the wind will not foul your cast, that the sun’s angle will not cast the wrong shadow or impede your vision at the wrong moment. You must make sure that the guy poling is out of the way of the backcast. How close are you going to let the fish get to you — or how far away — before you initiate the cast? And exactly where are you going to place the fly?